If you’re interested in the nitty-gritty of getting bicycle infrastructure projects off of the page and on the street, the Bicycle Advisory Committee’s Planning Subcommittee is your kind of meeting. The BAC Planning Subcommittee will be meeting in the LADOT offices (100 S. Main Street, 9th Floor) at 1:30 in the afternoon. Meetings usually run about an hour and a half. The Planning Subcommittee will be discussing a range of projects during the meeting. Here’s the agenda: Planning Subcommittee Agenda 3-08-11. This month, the subcommittee will further discuss the results of the BPIT meeting (our notes on the meeting coming in the next few days – you can also read up on LACBC’s, Flying Pigeon’s, and Orange 20’s notes from the meeting) and how the BAC can leverage their influence to make the project a success. Other projects being discussed are the Expo Bike Path, possible conflicts between future bike lanes/bike paths and the NBC Universal Project, implementation of bike infrastructure on the Figueroa corridor as part of the My Figueroa CRA/LA project, and making sure bike infrastructure accompanies the Crenshaw light-rail project. If any of these projects appeal to you, consider ducking your head into the BAC Planning Subcommittee meeting. If you can’t make it tomorrow, try to make it out to the full Bicycle Advisory Committee meeting, which is held on the first Tuesday of every even-numbered month at 7:00 PM at Hollywood City Hall. Often called “T-Committee” for short in City circles, the Transportation Committee meets this Wednesday afternoon in City Hall room 1010 at 2:00 PM. This committee will hear on Wednesday, among other items, the bicyclist Anti-Harassment Ordinance proposed by Council Member Bill Rosendahl. The self-same Council Member Bill Rosendahl also chairs the T-Committee, meaning that the draft ordinance has a very good chance this week at passing on to full City Council. 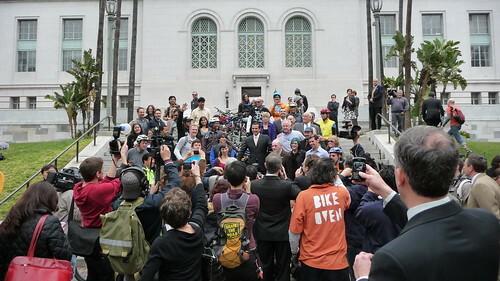 Ably covered by Ted Rogers at Biking in LA, this ordinance is an innovative, groundbreaking tool to help bicyclists protect themselves on the streets of Los Angeles. If you’re able, you owe it to yourself to come down to City Hall on Wednesday to express support for this ordinance and help shepherd it to full City Council and into law. If you can’t make it, tune into the BikeBlogChris twitter feed Wednesday afternoon. We’ll be covering the blow-by-blows from Room 1010 for your #BikeLA benefit. My gosh, it sure would be nice for the BAC to put up a website again so those of us who are interested know where to turn. I scour online bike calendars and I still miss the good stuff.